What do you think the most common disease in the world is? If words like “heart disease” and “diabetes” instantly jump to mind, you’re close, but not quite there. Periodontal disease, also known as gum disease, is by far the most common ailment across the globe, affecting about 50% of the U.S. adult population alone. At our practice, we take the health of our patient’s gums very seriously, so on this page, you can learn more about the signs and symptoms you should look out for as well as how you can get gum disease treatment in Ardmore. If left untreated, the teeth can become so exposed that the sensitive enamel around the roots will start to decay, which can eventually lead to tooth loss. In fact, gum disease is actually the most common cause of tooth loss for American adults. We always screen our patients’ gums during their regular checkups so we can catch and treat this disease quickly. However, should you exhibit any of the symptoms we just listed, don’t wait for your next checkup-- you should contact your dentist in Ardmore right away. Periodontal therapy will likely consist of something called a “deep cleaning,” which is intended to break up and clear away the plaque and tartar that has gathered on and underneath the gum line. It is actually made up of two separate procedures called scaling and root planing. With scaling, Dr. Guthrie will use small tools to gently clean along your gum line as well as the roots of your teeth. Then, root planing will be used to smooth out the rough surfaces of your teeth’s roots. This will make it more difficult for plaque to gather on them in the future, therefore lessening your chances of developing serious gum disease again. Depending on the extent of your infection, this deep cleaning can usually be completed over the course of one to four appointments. Local anesthesia will be used to ensure you are comfortable the entire time. After this, you’ll be advised to come in more often for regular dental cleanings as well as be diligent about taking care of your teeth at home. Altogether, this approach will not only remove the infection, but it will also make your smile feel a lot better as well! 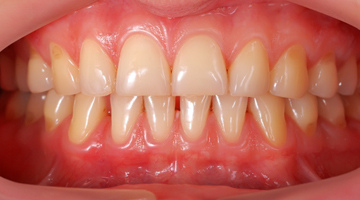 While gum disease might seem like a minor annoyance at first, it can quickly become much more serious over time. More and more research is showing that it is a leading risk factor for potentially fatal diseases such as diabetes, heart disease, and even dementia. The take away from all of this? Be sure to clean your gums whenever you brush your teeth, and if you show any signs of gum disease, be sure to contact us so we can help you get back on the road to optimum oral health. If you have any questions about gum disease, how treatment works, or if you’d like to schedule an appointment, please contact us today.